CodeRed JAG Wireless - Just part of the CodeRed Enterprise Software Suite of Products for Smartphone, Tablet, iPad, Android, Tablet PC. Get the latest updates in EMS news. Get your fix of the latest smartphone news. The true measure of your character can be seen in the way you behave when you know there's no one is around to see you. Is a dual function interface that allows your Medics the ability to instantly collect pertinent/critical patient data for normal EMS calls along with the ability to provide a Mass Casualty platform, all via smartphone. There’s no required or minimum number of fields that must be completed. 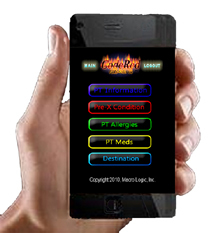 This gives Medics the flexibility to use this interface even when all the information is not readily available. They can gather as much or as little information as the incident’s circumstances permit. 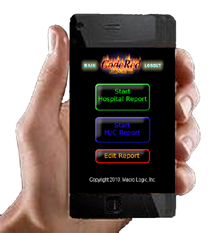 JAG is just part of CodeRed's Enterprise Software Suite of products for Fire and EMS responders. CodeRedEMS Software is a complete enterprise solution consisting of the Field Unit for data acquisition and in-field reporting along with the Administrator for in-house reports and the Administrator MD/BD to link your department directly to your billing associate along with your medical control for QI/QA. Combined, these packages provide a full featured comprehensive ePCR solution.